Use the radio buttons below to chose the areas you would like to keep from spraying and see the savings. Yes No Optional buffer around water and ag. Yes No Why waste the money? 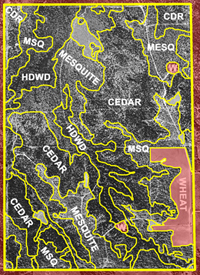 Yes No Herbicides for mesquite won't kill cedar, so why waste the money? OR use the extra chemical to treat 0% more acres.